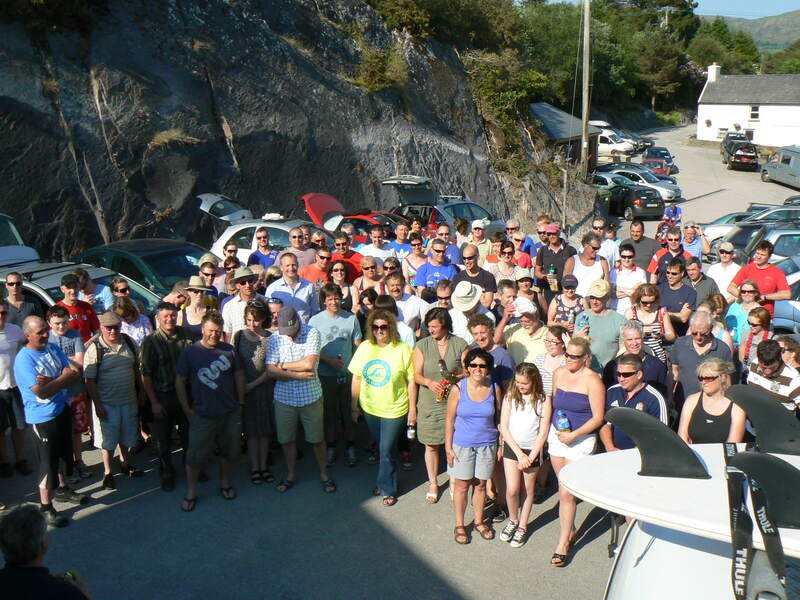 The crowd of 120 swimmers ready for the briefing at GaddinAbtGarnish 2013 (Photograph: Ossi Schmidt). Garnish Island (Irish: Oileán an Chuilinn) is a small island in Glengarriff Harbour, a very sheltered inlet off Bantry Bay, West Cork. There were three options for the swim: 1 km (out and back), 3 km (out, once around and back) or 5 km (out, twice around and back). I did the 5 km swim, as I had done in 2011 and 2012. Conditions were ideal – it was hot and sunny and there was hardly a puff of wind. The water was also very clear. Despite the perfect conditions, I was unsure of how I’d perform as it had been a long week to this point and I remembered very well how I struggled around the course last year. The first 500 m of the swim would tell a lot! There was hardly any fighting at the start, unlike previous years, and a group of three of us pulled away almost immediately. Alex Rathke of UCD Swimming & Water Polo, formerly of Dolphin SC, took the lead while I drafted off of Oran Kane, Killarney. The pace seemed fine out to the first buoy so I felt happy to leave Alex off and sit in behind Oran for the rest of the swim and try to pass him before the finish. Oran seemed to have major goggles issues (for once it wasn’t me with the goggle disorder) at about 800 m so I decided to head off in front of him. At the first corner of the island (about 1 km in) I noticed that Alex had taken a bad line and gone very wide – think my line was pretty good as I had to dolphin over a reef but didn’t get cut! The pace picked up a bit for the second lap – Alex took a lead on me and I pulled away from Oran. Alex still didn’t venture too far away for nearly another 1 km, it seems he still needed some guidance on the course! At the 3.5 km mark, though, he started to pull away and I could see him catch Ned and some of the 3 km swimmers. It was long before I did the same myself, swimming over Ned’s legs a few times just to let him know that I was there and that he’d been caught cheating! At the third corner, I was still able to see Alex and could also see Warren Roche just ahead of me. Having caught Warren, who also seemed unsure of the correct path, I kept a good eye on Alex’s position and could see him taking a bad line again – he went way off to the left and I managed to reach the buoy before him. With a lot of swimmers in the area, I lost sight of him and so sprinted the last 500 m back to the slipway. To my surprise, I was the first of the 5 km swimmers to finish and did so in 1 hour 8 minutes 24 seconds – definitely a new personal best 5 km time! Not long afterwards, Alex and Warren finished together (not quite at the slipway but close enough). Ned was next in wondering why the rest of us had taken “such a bad line” and he was followed very shortly by Oran. 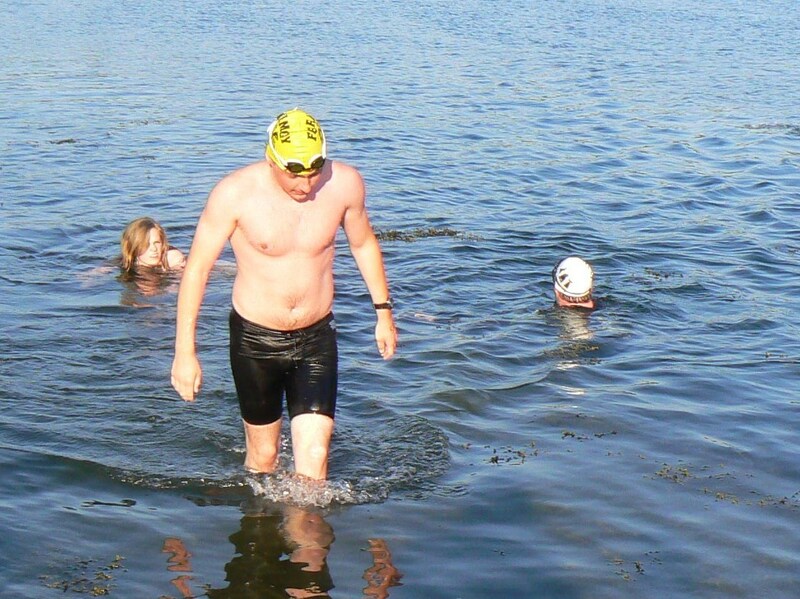 Me exiting the water at the end of GaddinAbtGarnish 2013 (Photograph: Ossi Schmidt). It was a great race in amazing scenery. It was a treat to finish a 5 km sea swim warm and be in no rush to get changed. On getting out, I met Dave Mulcahy and Declan O’Keeffe, both Fermoy SC, who had finished their 3 km swim. I also met Mary McEvoy, Gina Lyons, Adam Blaiklock, Niamh Fleming and James Slowey, all from Fermoy, who had finished their swims. Iain and Ciara MacCallum, Fermoy also, both finished their 3 km just after me. Ciara had originally planned to do the 1 km but was feeling good after the Fastnet Triathlon in Schull that morning so decided to do the 3 km! I got a bit worried that there was still no sign of Paul Noonan, also Fermoy SC, who was also doing the 3 km and should have been out well before me. I hung around for a while and he eventually should up, having “accidentally” swum the 5 km instead, his previous longest open water swim being 2 km! Well done to everyone from Fermoy who took part, it was great to see both Fermoy SC and Blackwater Tri Club so well represented. Other great points about the swim included seeing a few big moon jellies (a very welcome sign that the water is warming up), clean clear water in a beautiful setting, seeing lots of starfish on the seaweed (maybe a good sign for the Crosóige Mara relay in July) and top class kayak and RIB support. Well done again to Ossi and Imelda on organising a great event, I’m looking forward to next year already! This another sort of lazy post made up almost entirely of photographs. 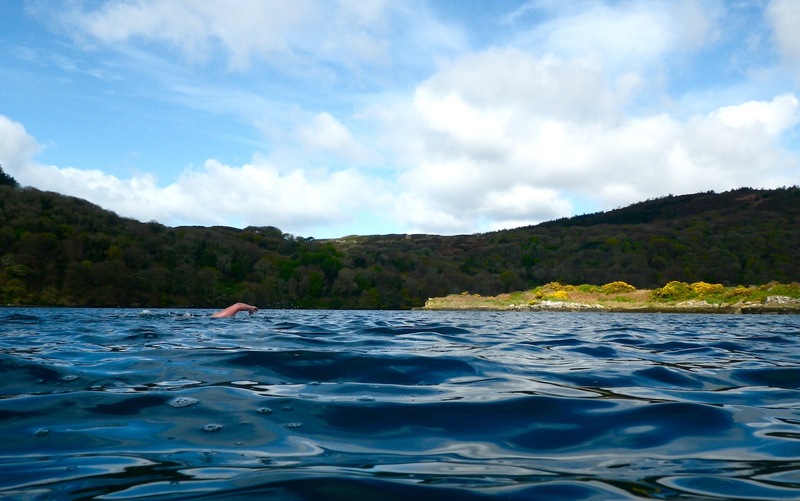 They’re worth looking at though as they are of a place where I’ve had some of my best and most memorable swims: Lough Hyne, West Cork. The hill of Dromadoon from Barloge Quay. 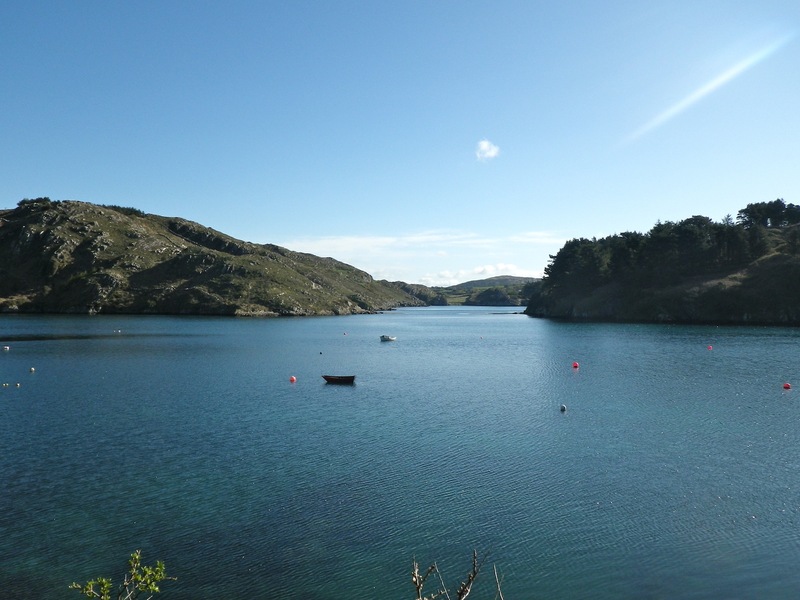 Lough Hyne is a marine lake between the town of Skibbereen and the village of Baltimore in West Cork. It’s connected to the sea by a very narrow set of rapids, known simply as the Rapids. The small size of the Rapids means that the lake has an asymmetrical tidal cycle: the tide flows in for about 4 hours 30 minutes and out for about 8 hours 30 minutes. The tidal range in the lake, at about 1 m, is also much narrower than the tidal range outside, which can be 4 m or more. 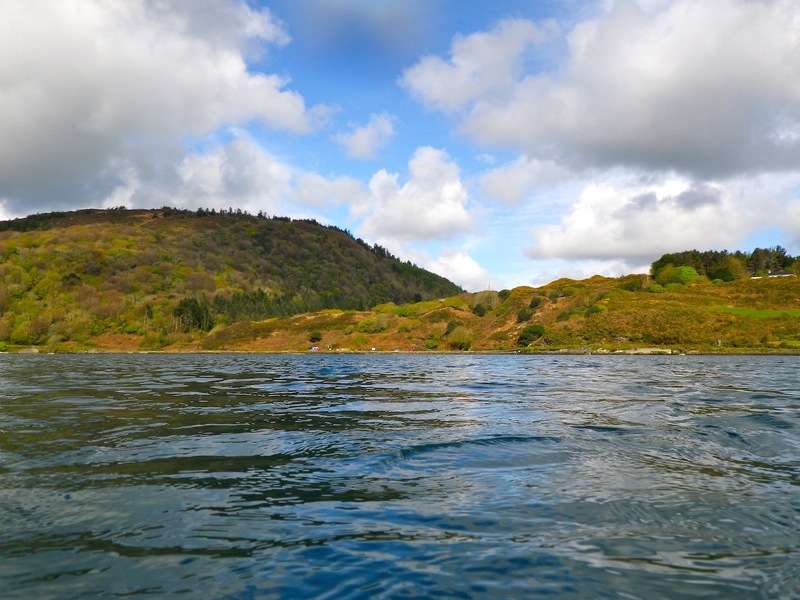 The freshwater input into Lough Hyne is negligible and so it is completely marine, but the geography of the lake means that it is full of relatively warm, well-aerated saline water. 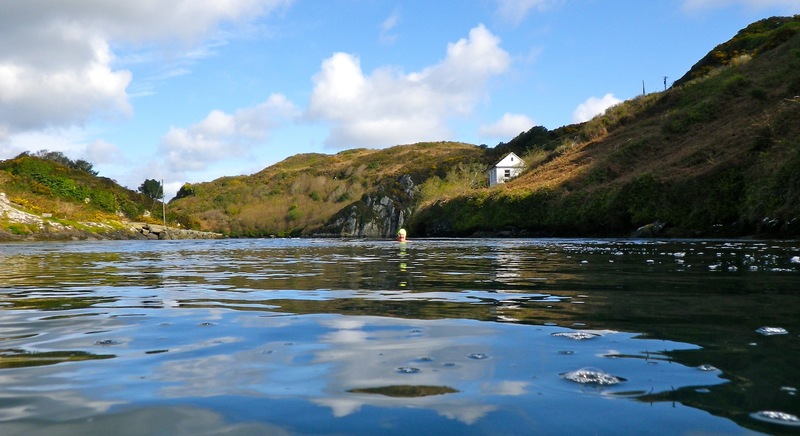 This makes it ideal for many kinds of marine life, including many species found nowhere on Earth except in Lough Hyne. 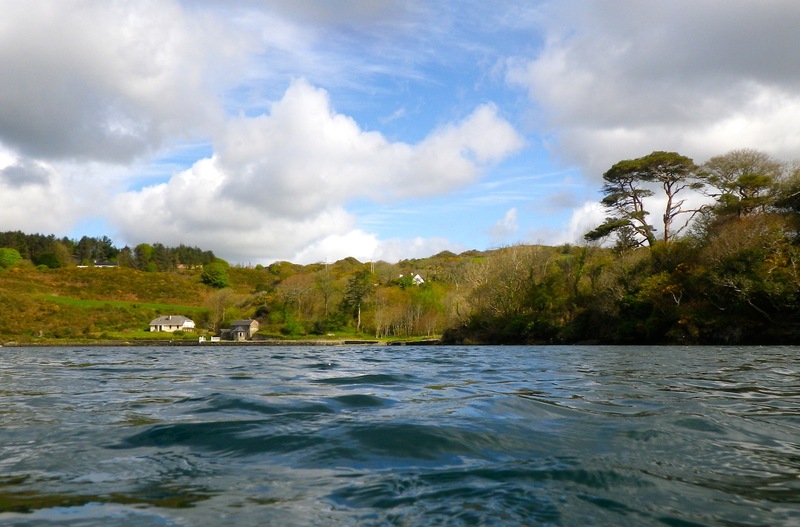 The lake and the area just outside it, Barloge Creek, was designated Europe’s first Marine Nature Reserve in 1981 and is now home to a research centre which is part of the school of Biological, Earth & Environmental Sciences (BEES) at University College Cork, where I am studying. The view across Barloge Creek from the road. 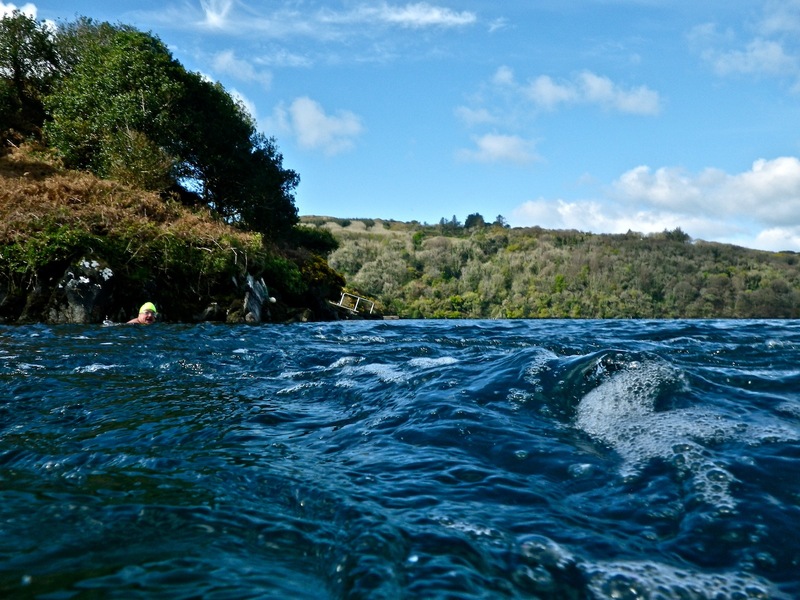 On this day, we decided to try a 3.7 km swim starting at Barloge Creek, heading over the Rapids into Lough Hyne, swimming west of Castle Island to West Quay, across to North Quay and straight back to Barloge Creek, going east of Castle Island. This might be a bit if a stretch as the water was only 10ºC or 11ºC and neither of us would be in wetsuits. The view towards Tranabo Cove from Barloge. It was a fine day so I brought my new waterproof camera to see of I could get any nice shots. I was hoping to get a few underwater wildlife shots as the water is crystal clear but it wasn’t to be on this particular day. Steve Black of Cape Town, South Africa via Ringarogy dons his ACNEG in anticipation of a slightly cooler swim than his Strait of Gibraltar crossing! Swimming away from Barloge Quay towards the Rapids. 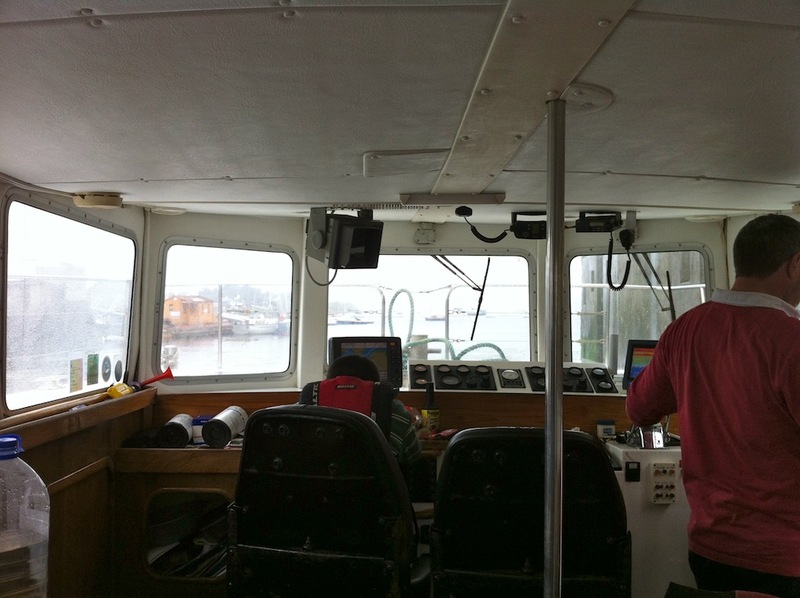 Just about to go over the Rapids, the quay on the left and the Bohane Laboratory on the right. Almost in the Rapids, looking like a good flow! Swimming over the Rapids is great fun but you must time it right. You need to be able to work out before you go, which way they will be flowing, how fast they will be flowing and what the depth will be. 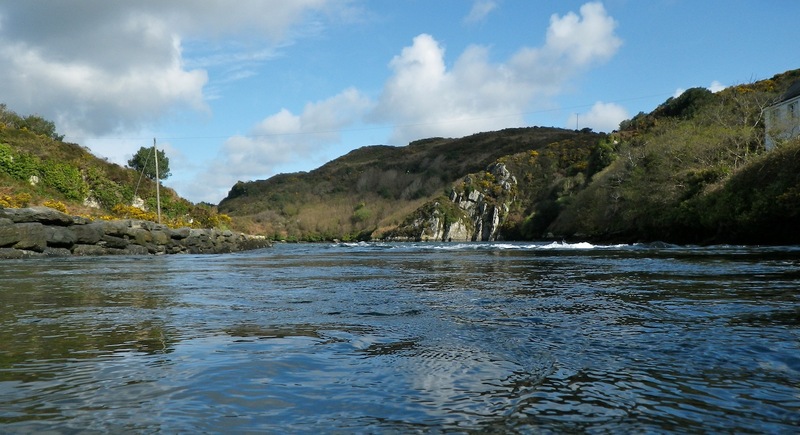 It’s well worth the 2 hour drive from Fermoy to Lough Hyne just to go playing on the Rapids! My Island in the Sun! 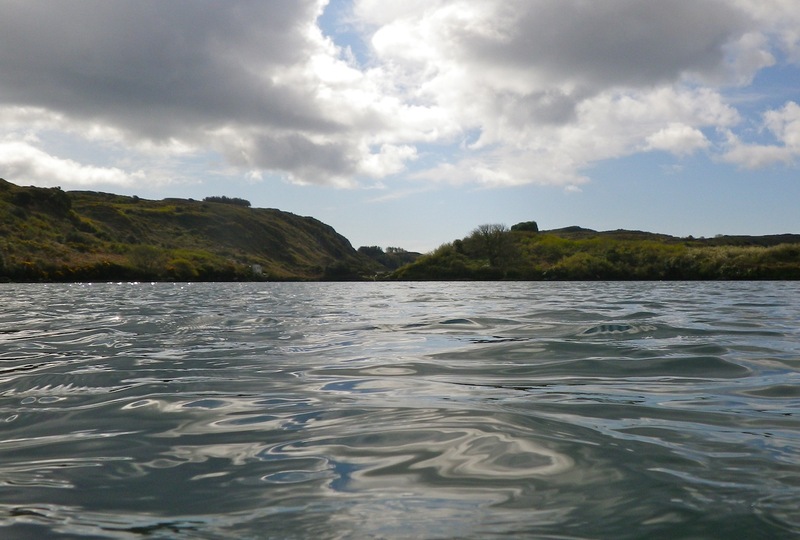 Swimming towards Castle Island, lit up by the sunlight, in Lough Hyne. 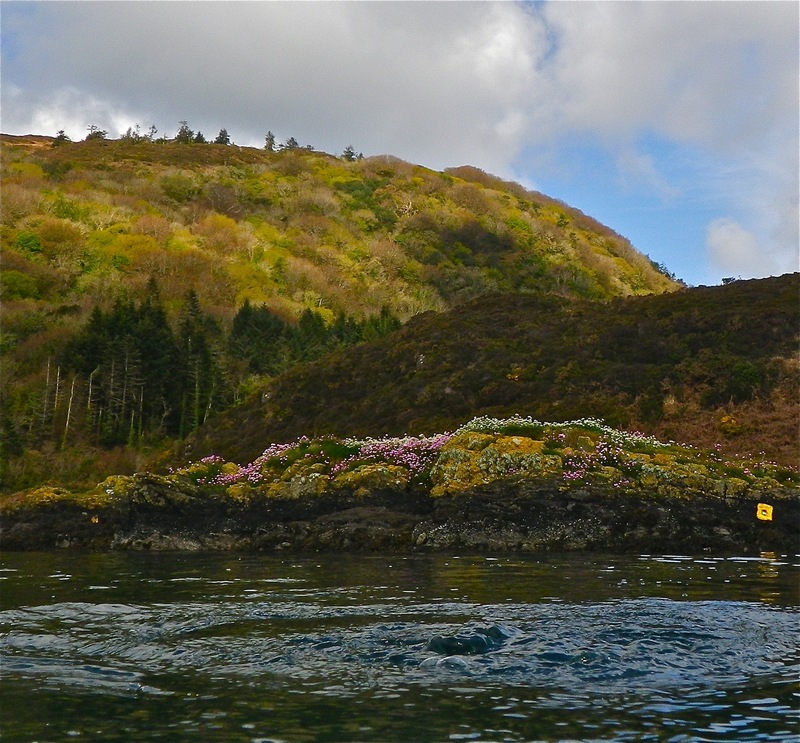 One of the rocky reefs at the southwestern corner of Castle Island in Lough Hyne. 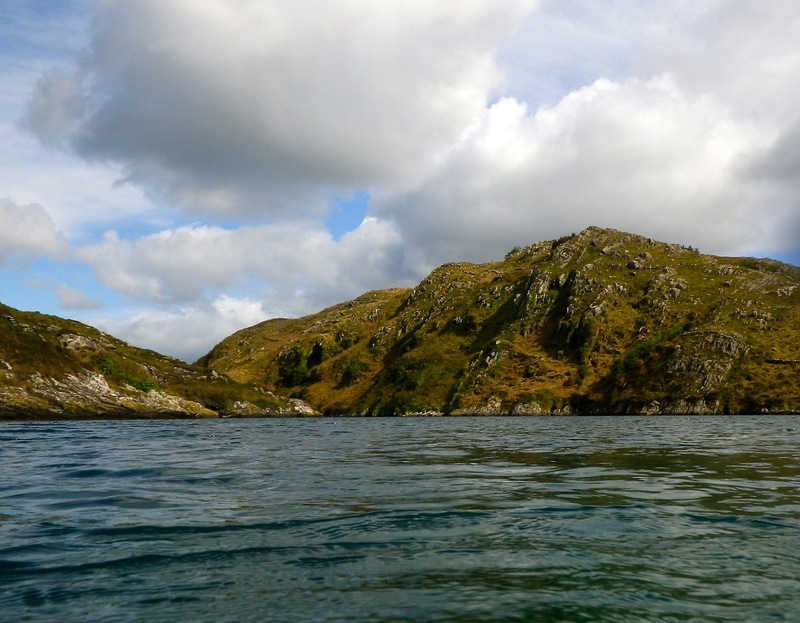 Lough Hyne is very deep, over 53 m in one place and there is also a 100 m-deep cave in the lake somewhere. Around Castle Island in the centre of the lake, however, there are shallow patches and some rocky reefs. 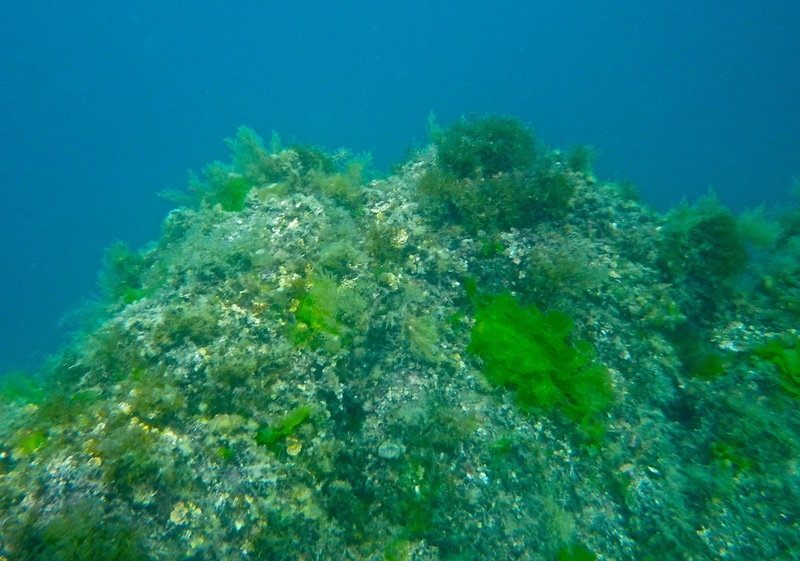 Here you can see lots of soft corals, cockles, oysters, scallops, sponges, spiny starfish, beautifully-coloured anemones, sea urchins, the odd seal and much, much more. Steve powers on towards West Quay, leaving a nice bubble trail. A patch of sunlight illuminates some of the woodland on the western shore of Lough Hyne. 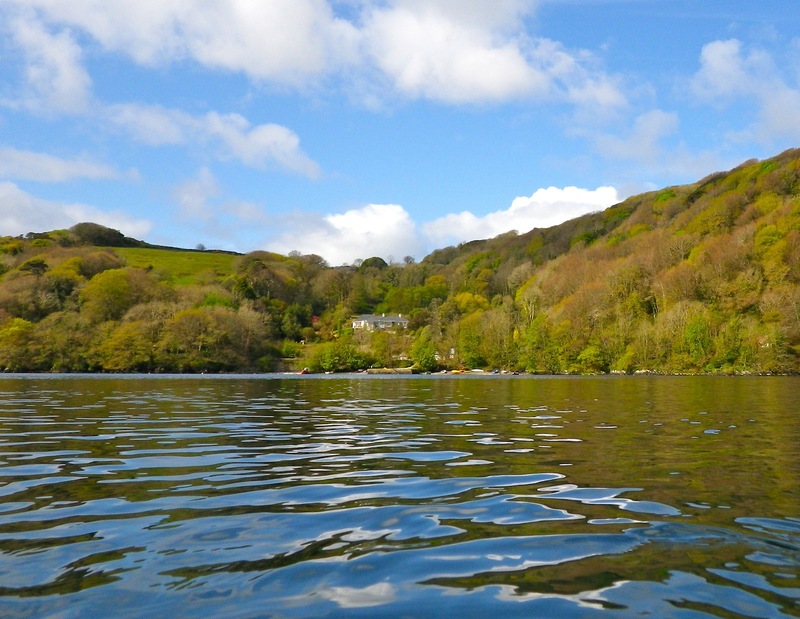 The lesser-used West Quay, Lough Hyne. 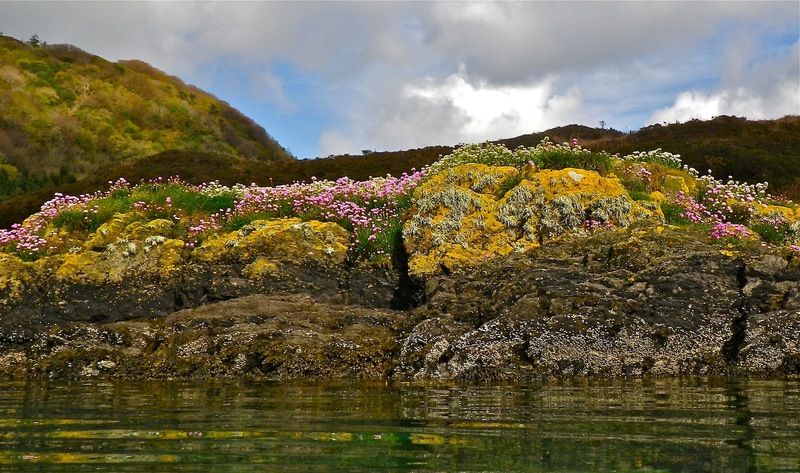 A typical scene on sheltered rocky shores on the South Coast of Ireland. 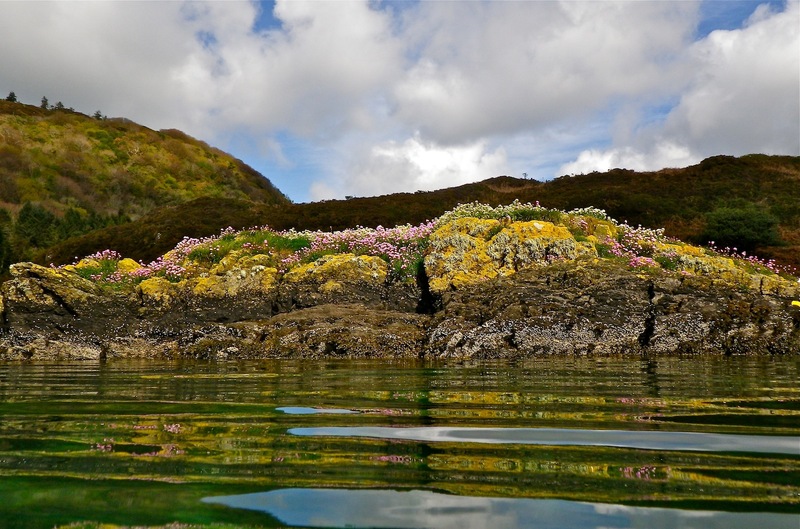 A closer photograph showing the variety of plants, animals and algae on this small islet on the northern shore of Lough Hyne. The little islet again with Knockomagh Hill in the background. 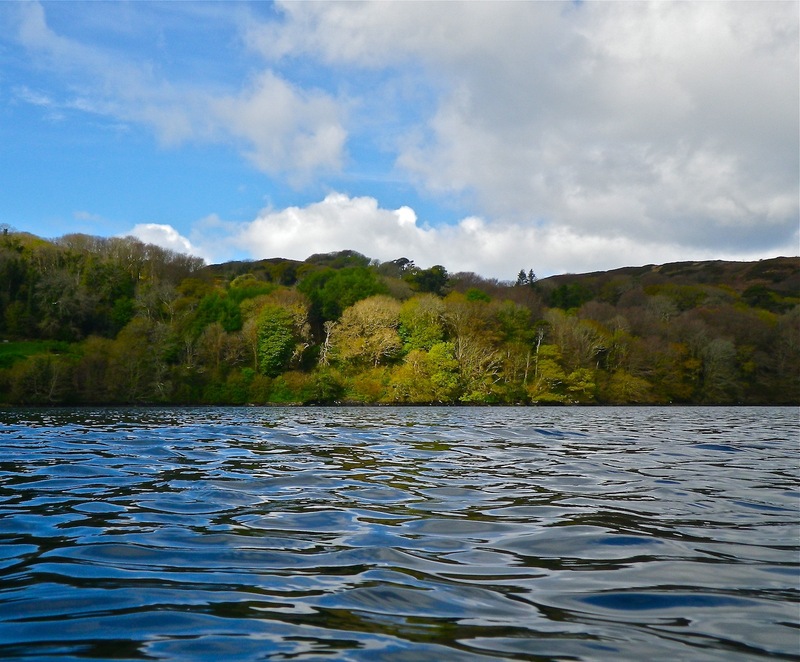 West Quay, Lough Hyne as seen from the more frequently used North Quay. 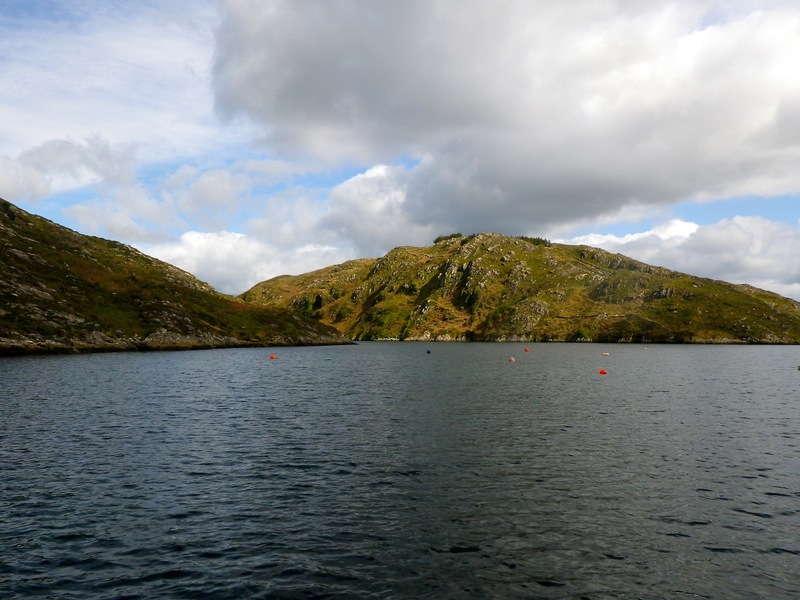 The eastern shore of Lough Hyne. 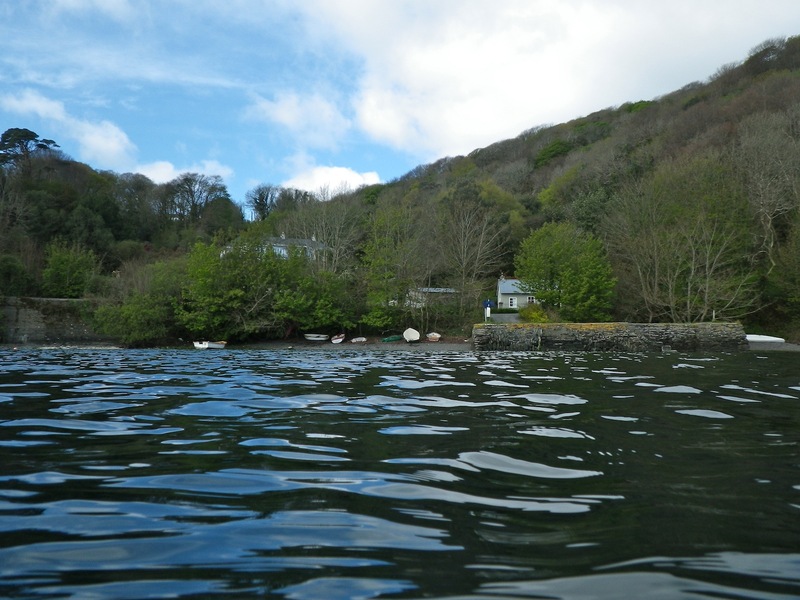 Some of the houses around Lough Hyne. The main house, Lough Hyne House, is hidden behind the trees. 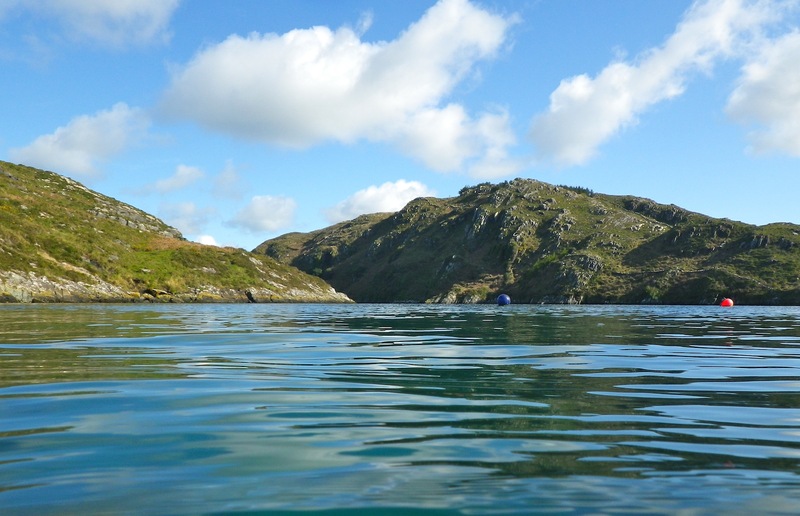 Looking back towards the northern shore of Lough Hyne. Straight ahead is the way back out to the sea, though it mightn’t look like it. Steve gets ready to dive back into Southern’s Bay having had to walk past the Rapids on the quayside. Back into Barloge Creek and almost finished the swim! Steve finishing the swim back at Barloge Quay. Steve after completing his final swim of the Oceans Seven, the Tsugaru Strait in Japan. West Cork’s own Stephen Redmond has been voted WOWSA Man of the Year 2012 in a global online poll, it was announced yesterday. The first (and only) person to have conquered the epic Oceans Seven challenge, Steve topped the field of fifteen nominees, which included such distinguished athletes as Trent Grimsey of Australia, Oussama Mellouli of Tunisia, Thomas Lurz of Germany and Craig Dietz of the USA! He succeeds Randy Nutt of the USA, Petar Stoychev of Bulagria, Marcos Diaz of the Dominican Republic and Jamie Patrick of the USA. Ireland has a history of punching above our weight in these awards. This year, Ned Denison‘s Cork Distance Week and Donal Buckley & Evan Morrison’s online forum, MarathonSwimmers.org, were also nominated. While in previous years, other swimmers, including Lisa Cummins, Julie Galloway and Anne Marie Ward have been nominated for and won WOWSA awards. Spanish Island and the south-west corner of Ringarogy. The swim came at the end of a long and difficult week. 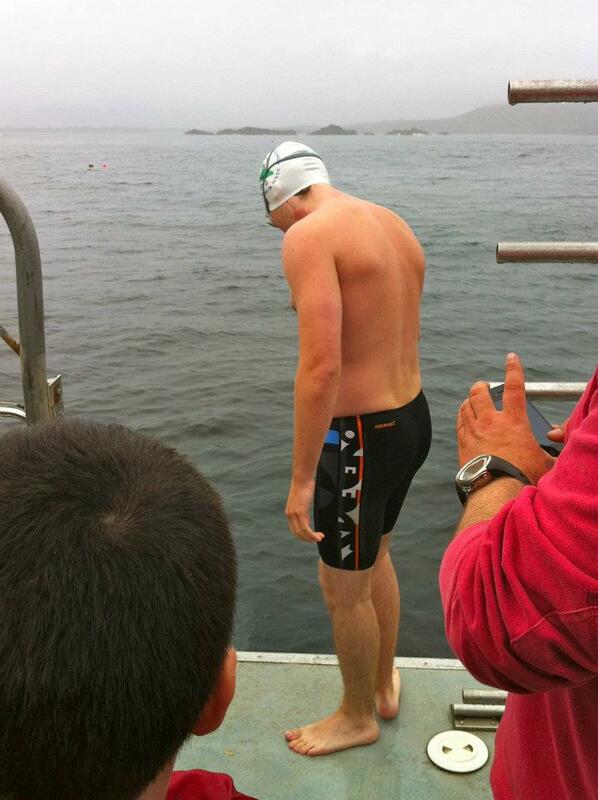 The previous Thursday I did my 18.6 km swim from Fermoy to Ballyduff. 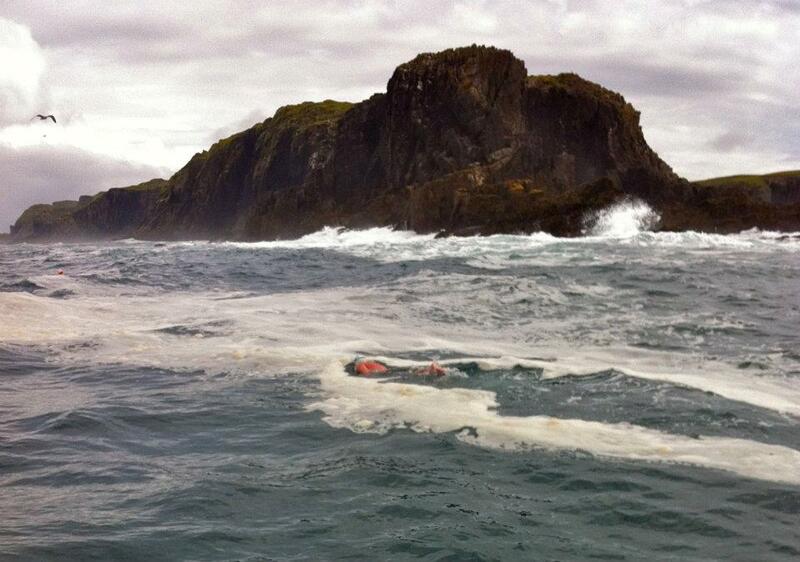 On the Saturday I did the 6 km Beginish Island Swim in Kerry and in the early hours of the next morning we got the dreadful new that Páraic Casey had passed away during his English Channel solo attempt. 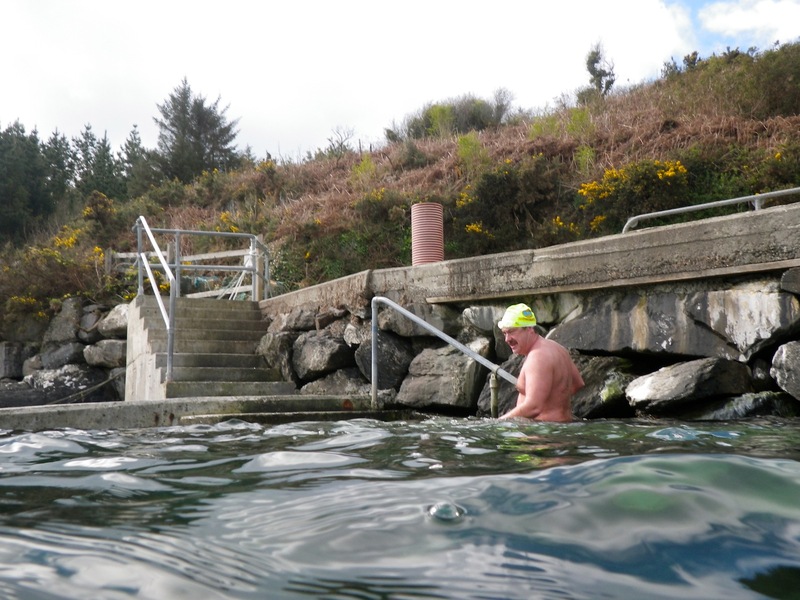 That Monday I had a cold and miserable swim in Myrtleville, the following morning did my 15.0 km swim from Ballyduff to Cappoquin and on the Thursday I had lovely “adventure” swim at Kilfarrasy Beach on the Copper Coast with Donal Buckley and did a lap of Sandycove at just before midnight – that’s 5 hours of driving the evening before a long swim! Anyway, it felt great to be on the road to West Cork on a warm and sunny Friday morning after the week that I’d had! For this swim, I had arranged to meet Steven Black at his house on the island so that he could explain the correct course to me. Also, his son Rowan kindly agreed to kayak for me. As with any visit to Ringarogy, the adventure starts as soon as you cross the causeway onto the island. There is a saying that says that “civilization never crossed Ballymaquirk Bridge”, and this comes to mind once you arrive on Ringarogy. Tarmac on the road is a luxury, and where it does exist, you shouldn’t expect it to extend from one side of the road to the other. While navigating the highways and byways of the island, you may come across one or two of it’s inhabitants “trying to make land where God failed”, as one of them eloquently put it. 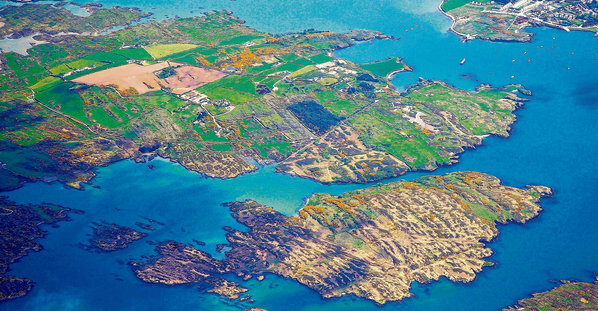 (In West Cork the land can be rocky and difficult to farm, especially on the islands.) True to fashion, I got completely lost trying to find Steven’s house. I did get there eventually get there but not before having to reverse half a mile down a rugged boreen! (The word “boreen” is Hiberno-English for “small road”, it comes from the Irish bóithrín.) After the 2 hour journey from Fermoy, it was a relief to get out of the car! 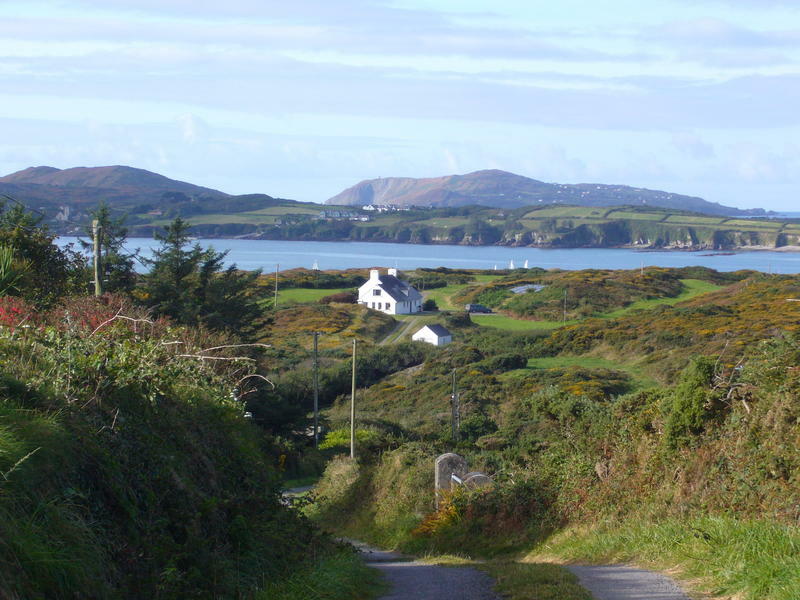 Sherkin Island and Cape Clear as seen from the road on Ringarogy. Besides the peace and quiet, Ringarogy offers some great views, despite being relatively flat. From the top of Steven’s driveway, one can see all of the island of Roaringwater Bay, including those that I’d already swum around (Sherkin Island, Cape Clear, Heir Island and Spanish Island). 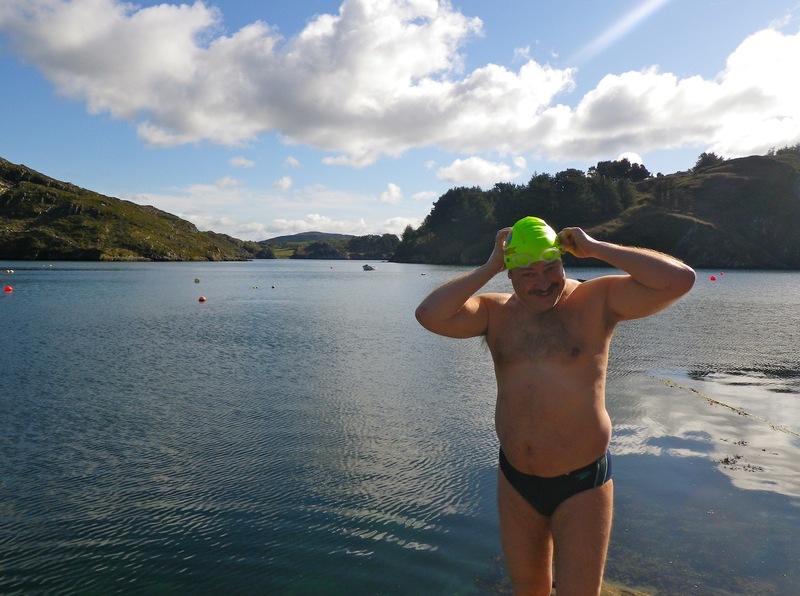 In any case, that’s enough about Ringarogy, time for the serious part – the swim! After getting changed at Steven’s house and loading the kayak into the jeep, we drove to a random gate along the road. There we stopped, leaving no room for anyone to pass, though it was highly unlikely that anyone would wish to do so for a few days at least! We then had to hop over the gate and go on a bit of a trek to find the start (pretty much bang in the middle of the aerial photograph above) in Hackett’s Creek – this was a bit of a rushed job as we had to be started at a certain time to reach the bridge on the causeway at exactly high tide. Just as we were ready to start, I realized that I had forgotten my feeds – ah well, I would just have to do without them! 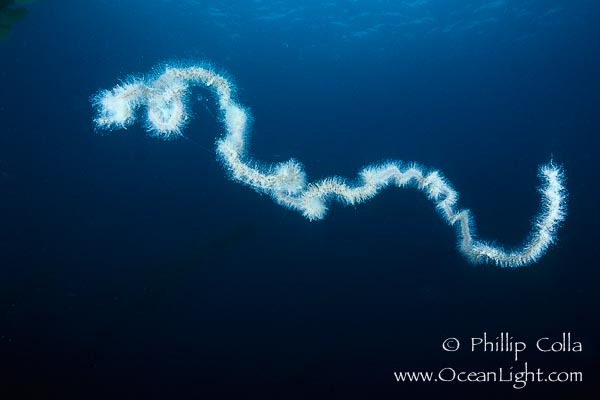 An example of a pelagic siphonophore – these are closely related to the Portuguese man-o-war and have a nasty sting. I finally hit the water at exactly midday and Rowan followed on in the kayak. The water was about 13ºC, which is a little chilly but ok for a 10 km if the air temperature is warm, which it was. We headed straight for the gap between Spanish Island and another small island, which I think is called Aughinish. There are lots of seals in this area so I was a little bit nervous… Much to my relief, none of the seals that we saw (mostly grey seals) didn’t come too close. Keeping the island on our right, we headed up the Ilen. 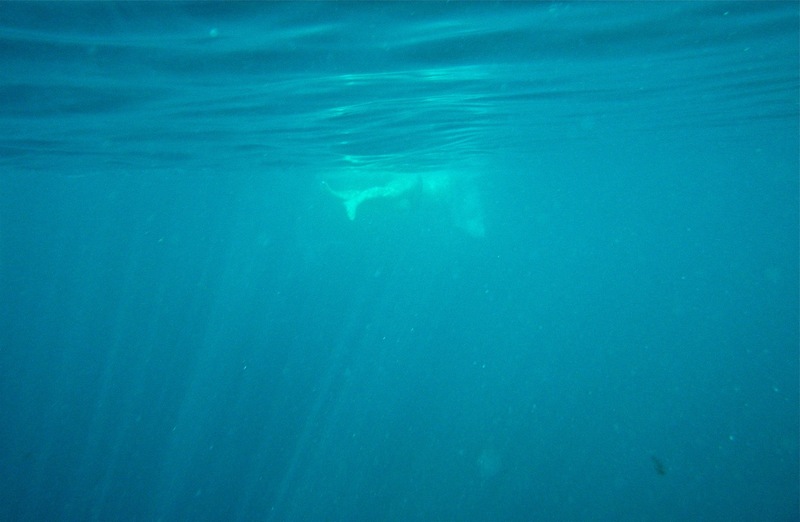 There were some interesting things to see underwater – there seemed to be a lot of aquaculture in the area and few jellyfish, although I did spot one or two of those stinging siphonophores (pictured right) that I’d first during my swim around Cape Clear a few weeks previously. Having eventually reached the bridge (and deep water) it was good to see Steven waiting there with my feeds! He dropped the feed down to me and I drank it and through the bottle back up. The tide was still pushing me back under the bridge so we had time for a quick chat before it turned and we continued on the swim. I felt great having had a feed and having the tide with me. 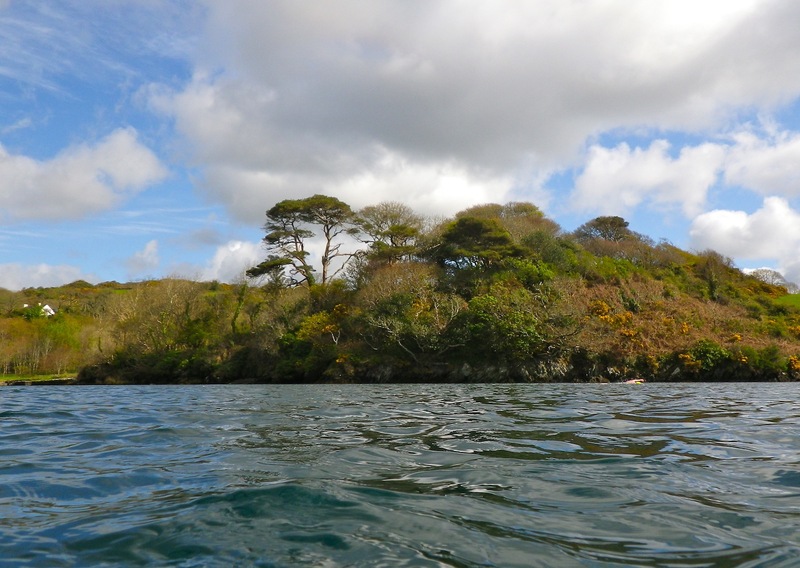 We kept on our course, passing all the familiar sites of Church Bay and Baltimore Harbour. Then, we entered the very narrow gap between Ringarogy and Spanish Island – this is the most beautiful part of Hackett’s Creek and it’s a real pity that I’ve no photographs of it. About 10 minutes later, we arrived back where we started. Rowan stopped the stopwatch on his mobile phone and told me that my time for the 10 km was 2 hours 30 minutes – not too bad for me! We reached Cape just before midday. I took off my clothes and put on my togs, swimming cap and goggles. I wasn’t too cold at all standing out in the air, but I know that this wouldn’t be the case once I was in the water! I gave one look into the cold, dark water and jumped in. 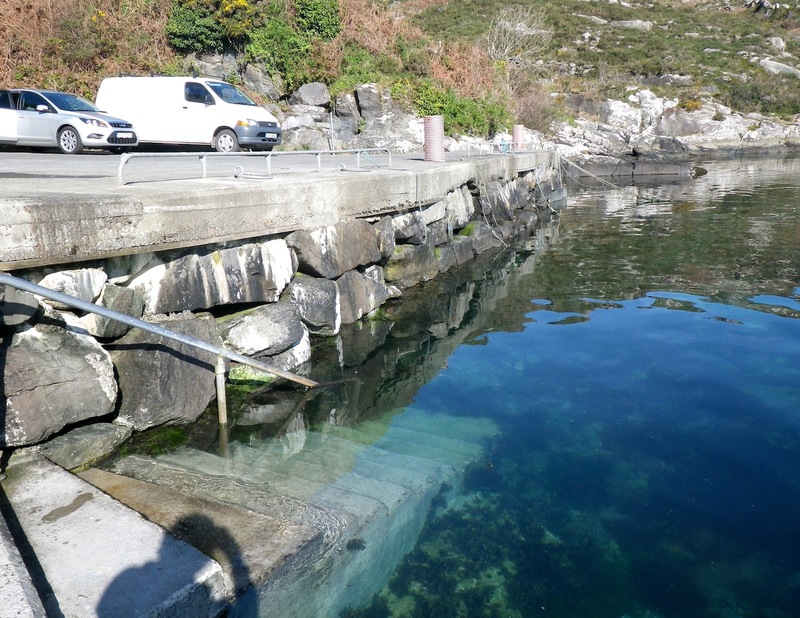 I went straight towards the slipway for the start, but didn’t exit the water onto it (John told me that this wouldn’t be too safe as the slipway would be very slippery indeed with the tide out). After placing my hand on the slipway, I was started! I have to admit that I really felt the cold of the water, this made a little bit nervous about the swim and it was no help to me that the water was so dark at the same time. But I did my best to put these concerns to the back of my mind! 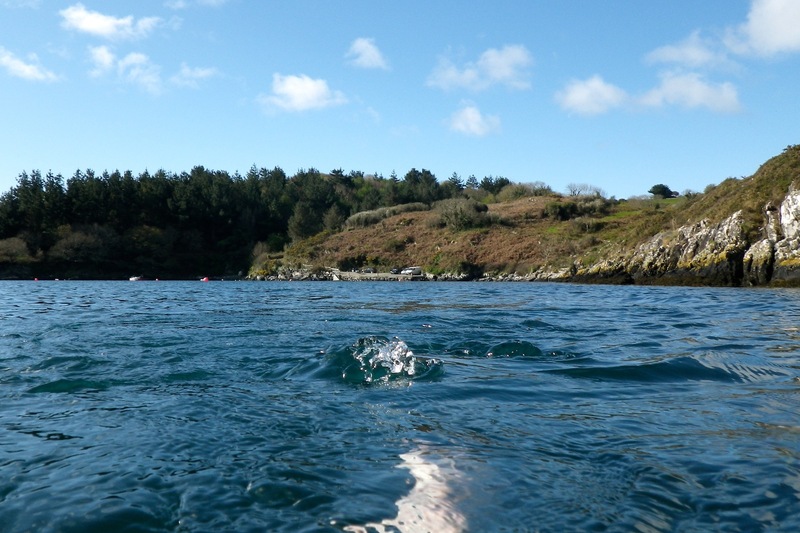 While swimming around the first corner of the Island, Cooslahan Point, there were flocks of birds (guillemots, razorbills and so on) flying around me. However, the view underneath me was not so pleasant! Jellyfish of all kinds were coming into my view, including some that were entirely new to me… I’ve neglected to mention until now – we were going around the Island in a clockwise direction. Swimming south-west at Cooslahan Point. Waves breaking over Carriglure, I’m in there somewhere! The next way-marker was Carriglure, a large rock situated just below the surface of the water a few metres from the bottom of the cliffs. The waves were breaking over the top of the rock that day and I didn’t want to swim between it and the cliff at all, but John told me that it would make much more sense if I did. So, I did it, undoubtedly with great hesitation, but the way through was a lot shorter than it would have been had I swum on the outside of it. After meeting up with the boat I had my first feed. What is in the feed is a 4:1 carbohydrate to protein formula with some warm water – High5 is the name of my feed of choice. 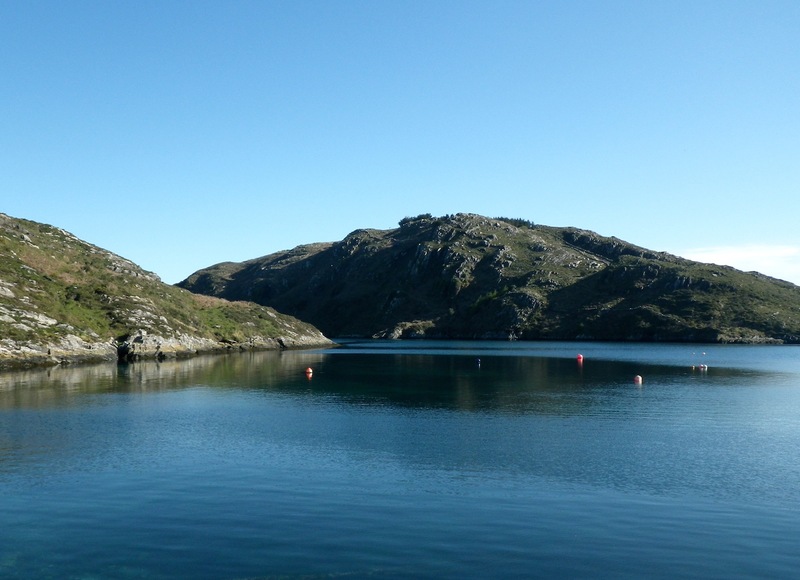 It wasn’t long before we had reached Pointanbullig and were just about to cross the South Harbour. I’m told that there were seals and dolphins swimming around me at this point but, unfortunately, I didn’t see any of them myself! I didn’t take us very long to cross the South Harbour but as we were progressing the waves were getting bigger. 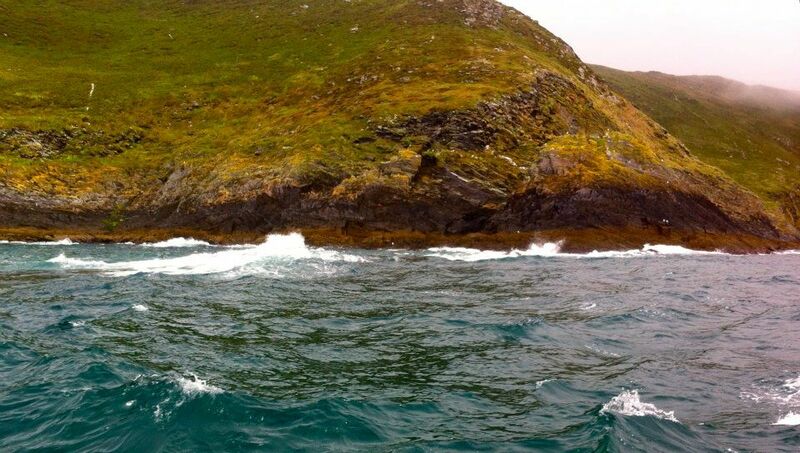 Having reached Blananarragaun, the most southerly point on the Island, there was a heavy swell. From time to time, I could see the Fastnet Rock, Carraig Aonair in Irish, over the tops of the waves. This song kept coming into my head whenever I saw the famous rock. Looking out to the Fastnet, often alluded to as the Teardrop of Ireland, it is hard not to think about the many people who lost their lives in the seas around it over the last hundred years or so. After a while, we were at the imposing Bill of Cape! 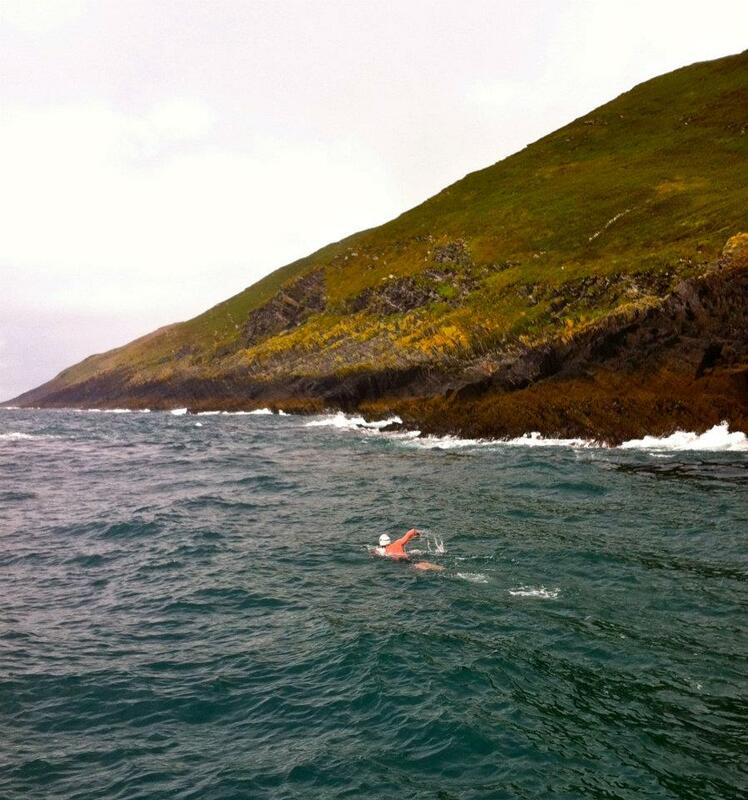 I was very happy having reached this point because it meant that I had more than half of the swim done. There was a lot of foam on the water at this point due to the action of the Atlantic swells on the rocks, but this didn’t bother me too much as I have plenty of experience with foam and the like from swimming at Sandycove in Kinsale. Swimming through the foam at the Bill of Cape. 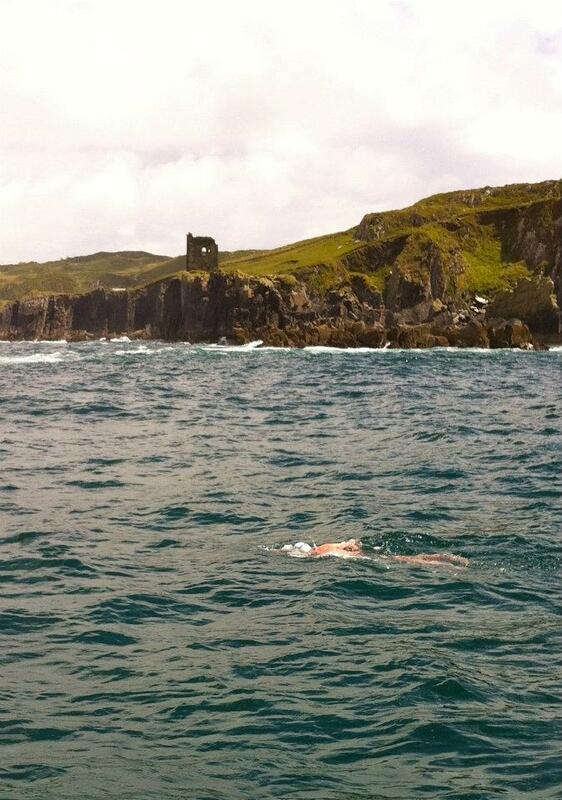 Swimming a few hundred metres out from Dún an Óir, the sun comes out at last! 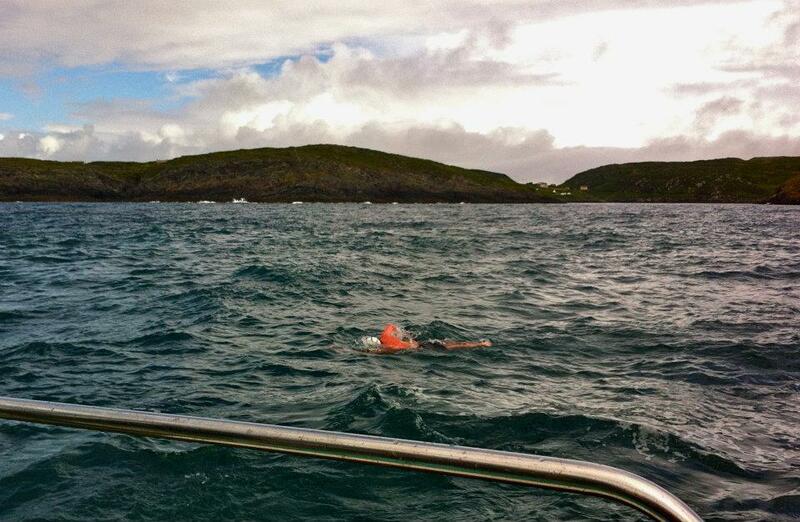 Coming around the last corner of the swim, the current was like a river flowing through the Gascanane Sound! After spending 3 hours 47 minutes 32 seconds in the water, I landed back at the slipway in Comillane. 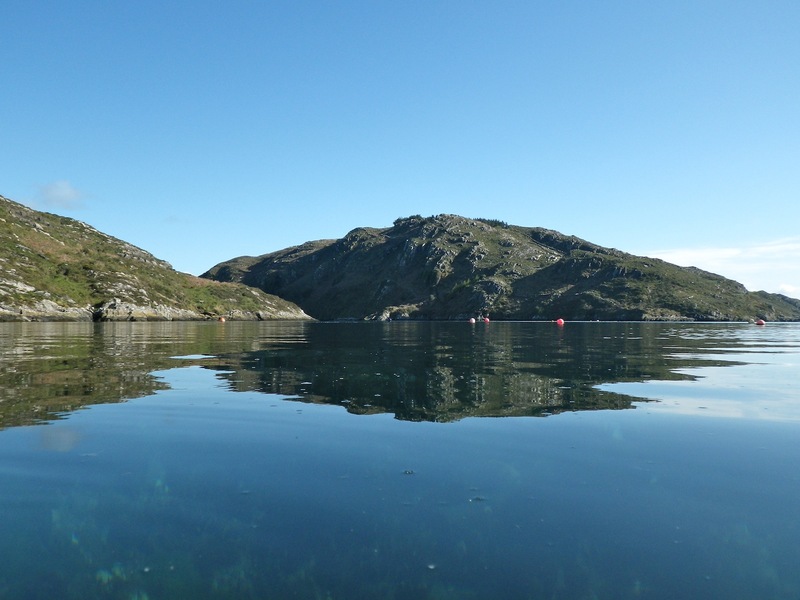 Until now, no one had told me the temperature of the water – 11.5ºC – I was very glad that I didn’t know that before the swim! 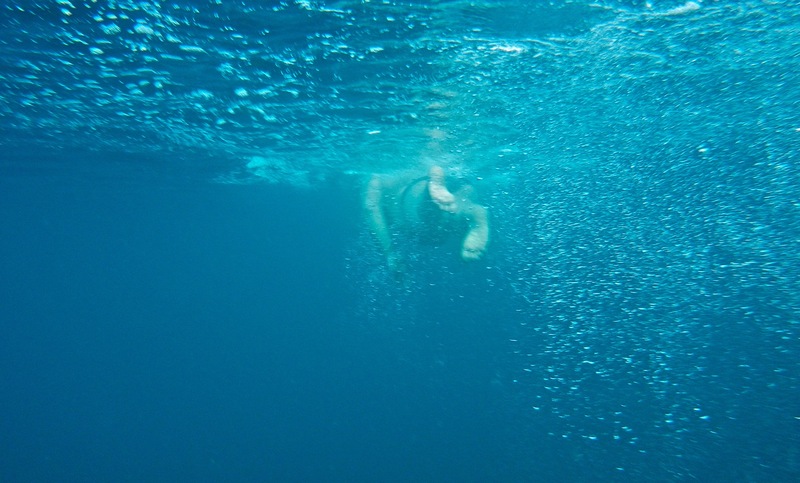 Once I was dressed again, a few of the men that were on the boat went diving for a short while and Tom swam into a sea cave while we were waiting! All that done, we headed back to Baltimore after a very successful day. 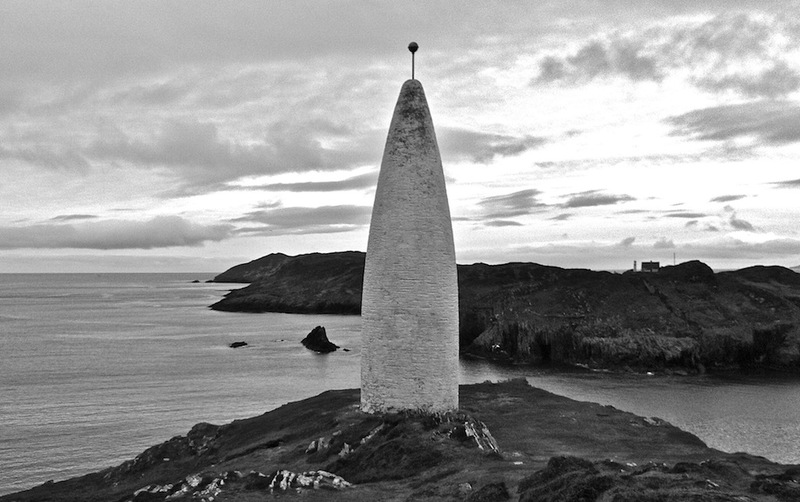 The Beacon or Lot’s Wife, Baltimore looking out at Sherkin, Cape behind. 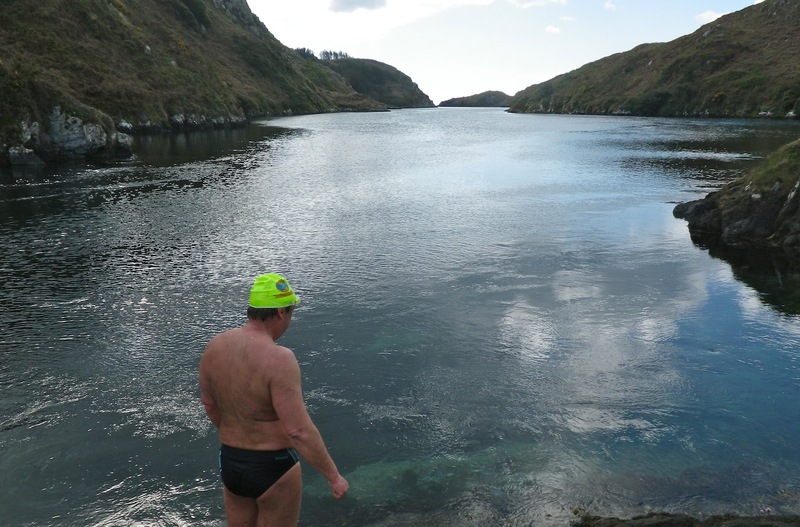 After a failed attempt at swimming around Heir Island with Steven Black and David Merriman, I thought that it would be a nice idea to try to swim around all of the Carbery Isles! 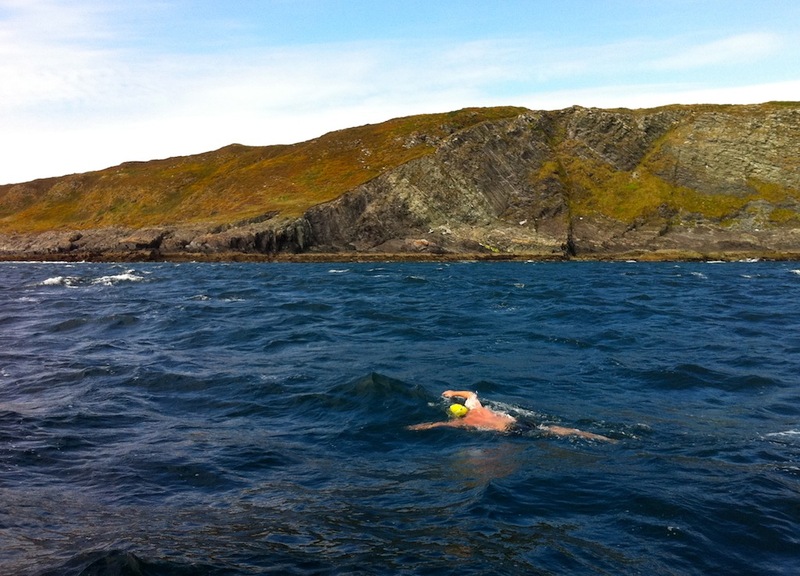 At the end of August, I swam around Sherkin, with Lisa Cummins on the support boat, and the day after, Gábor Molnár and I swam around Heir Island. No one had ever swum around those two islands before! 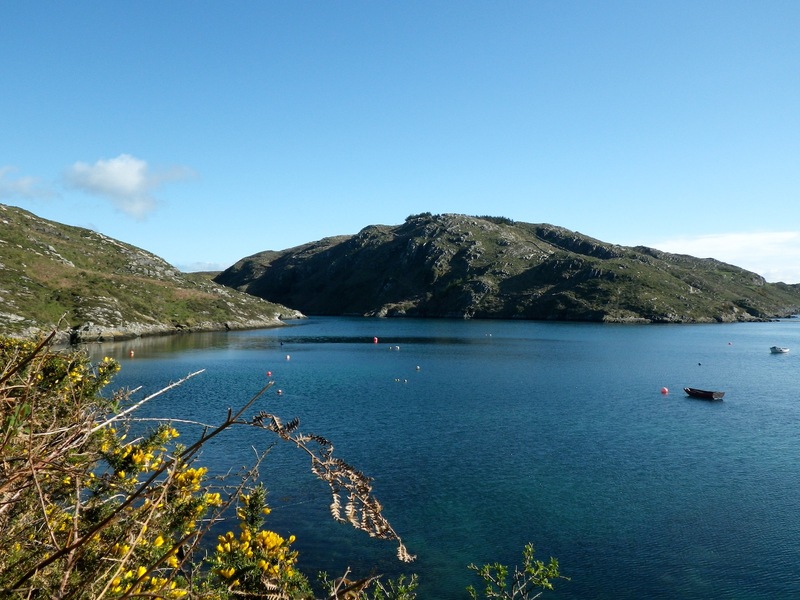 Towards the end of the summer, I swam around Spanish Island with Steven Black and Severin McCullagh, as well as a few seals… I now had three islands done before the end of 2011 and had two more in mind for 2012. Cape Clear was the first of those. Cape is a beautiful island. It is situated 8 km out to sea from Baltimore and is 5 km long and 2 km wide. There is a permanent population of just over 100 people on the island and it is an official Gaeltacht area, that means that Irish, specifically Munster Irish, is the primary language of the Islanders. Starting and finishing at the slipway in Comillane on the eastern side of the Island, the shortest possible circumnavigation is 13.2 km. While that doesn’t seem so bad, it can be hard to quantify the challenge by the distance in this bit of water due to tidal streams, winds and so on – the whole thing depends on the weather, just like everything else in Ireland! On board the Amy-K just before leaving the mainland for Cape.